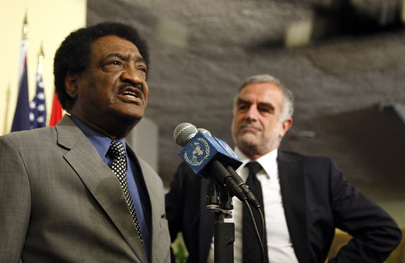 UNITED NATIONS, April 29 -- With the US and UN surprisingly quiet about ballot stuffing and deaths in Sudan, on Thursday Sudan's Ambassador to the UN bragged to the Press about changes made to the resolution extending the mandate of the UN Mission in Sudan, UNMIS. He said that a congratulations for the elections had been added, as well as various statements "against outside interference." Inner City Press asked him about a controversy concerning statements reportedly made by lead US envoy to Sudan Scott Gration, about expecting the South Sudanese to vote for independence in the referendum slated for 2011. Sudan's Ambassador said that even on this, his country had sought clarification from Gration's Office, and that in any event Gration was soon traveling to Khartoum. Back on April 28, while US Ambassador Susan Rice was at the stakeout taking five questions on Iran, Inner City Press spoke up and asked, A question on Sudan? 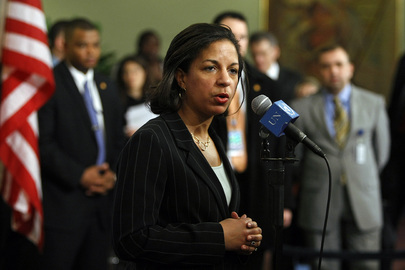 Ambassador Rice said no, the Iran questions had taken up all the time. Then she left. Video here, at end. can you confirm that Sudan has sought clarification, from the Mission or Gration's office? can you provide whatever clarification there is of Gration's remarks, or what he actually said? Given that Amb Rice yesterday took five questions (from two questioners) about Iran, and did not take a Sudan question which was begun, can you provide Amb Rice's view of the now completed Sudanese elections, and of what Gration said? Please confirm that Amb Rice is not going on the now rescheduled Council trip to DRCongo to try to keep MONUC in the country, and state who from the US Mission is going, and what they hope is accomplished on the trip. Despite Ambassador Rice on Monday having told Inner City Press to always seek confirmation from her spokesman about such matters as who would go in her stead to the Congo, and what their rank is, four hours later none of the above questions had been answered. 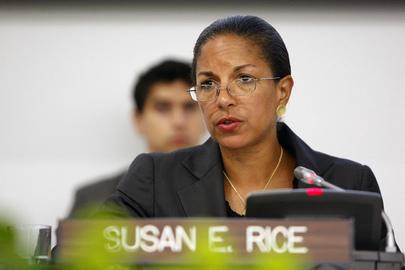 That the US Mission is focused on Iran and the NPT is further made clear by the announcement that on Friday at 1 p.m., Ms. Rice will appear by video in New York from Washington DC, along with Ambassador Burke, to speak about the NPT. Why so little, at least in public, on Sudan and the Congo?